Since state Sen. Wendy Davis' June 25 filibuster, organizations on both sides of the abortion debate say they have seen a surge in donations as well as increased engagement on social media. 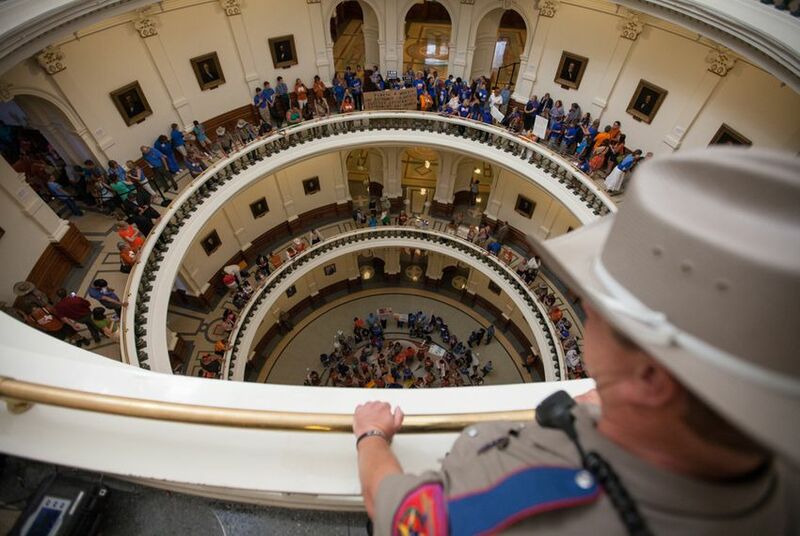 After a legislative debate over an omnibus abortion bill that featured a nationally watched filibuster and hearings packed with passionate testimony, Texas organizations on both sides of the issue say they have experienced a boost in profile as well as donations. Representatives from Planned Parenthood’s state branch, NARAL Pro-Choice Texas, Whole Woman’s Health and the Texas Alliance for Life all said their organizations had experienced hikes in donations since state Sen. Wendy Davis’ filibuster at the end of the first special session. Representatives for Texans for Life and Texas Right to Life said they did not readily have information about donations or were not disclosing it to news outlets, respectively, though all groups say they experienced a surge in engagement. The groups are required to report the funds raised by their political action committees, but those reports alone can provide an incomplete picture. The organizations' nonprofit branches can receive donations without reporting to the state Ethics Commission how much they received or from whom, though they can often use a portion of those donations for political communications. The NARAL chapter, the only group that disclosed figures on donations, has received almost $20,000 since the filibuster, said executive director Heather Busby. Typically, the organization might receive $1,000 to $2,000 in a two-week period, Busby said. The majority of donations have come from Texans, but about a third are from out of state. Pojman said the donations that Texas Alliance for Life received were “extraordinary, compared to what we're used to.” He would not disclose specific numbers, citing organization policy, but said they were “much higher than we would expect for a July.” The vast majority of donations were from Texans, he said, though some came from out of state. About halfway through the first special session, Gov. Rick Perry added legislation adding regulations on abortions to the call. The issue became the subject of heavy traffic on social media sites, and hearings and floor debate on the legislation attracted crowds of people. During a House committee hearing on the legislation — at the time known as House Bill 60 and Senate Bill 5 — the hashtag #HB60 briefly trended nationwide on Twitter. The legislation bans abortion at 20 weeks post-fertilization and recognizes that the state has a compelling interest to protect fetuses from pain; requires doctors performing abortions to have hospital admitting privileges within 30 miles of the facility; requires doctors to administer the abortion-inducing drug RU-486 in person, rather than allow the woman to take it at home; and requires abortions — including drug-induced ones — to be performed in ambulatory surgical centers. Attention on the debate surged when Davis’ filibuster and outbursts from the Senate gallery helped prevent the Senate from voting on the legislation as time ran out in the first special session. After a second session was called, debates and protests were featured on national news outlets, and the bill, re-filed as House Bill 2, finally passed the Legislature on July 12. Natalie Kelinske, a Planned Parenthood spokeswoman, said the increase in donations that her organization experienced is not unique; legislative battles over abortion issues usually result in an increase in donations. Though the Planned Parenthood chapter hasn’t released the amount it has received since the filibuster, Kelinske said, donations have come from within Texas and from other states. Though most groups contacted either could not or would not provide specifics on what they had raised since the filibuster, many said they had experienced increased user engagement online, citing increased numbers of followers on social media sites or strong responses to online petitions. Emily Horne, a lobbyist with Texas Right to Life, said the organization had seen “an explosion” online, with the group’s followers on Facebook increasing from 3,000 to 15,000 over the course of the abortion debate. Planned Parenthood spokeswoman Danielle Wells said 35,000 people signed a petition criticizing HB 2 within a week of its passage. But with legislation no longer being actively debated — Perry signed HB 2 into law on Friday — it is unclear whether the donations or attention on Texas groups will persist. In recent weeks, organizers rallied around specific events related to abortion legislation, such as hearings or floor debates.